Snow days are coming, so it’s time to stock up on hot chocolate. But why buy the mix when you can make your own? You might not be able to resist sipping some yourself. Take your hot cocoa to the next level with these decadent recipes. Your kids will like this double-chocolate hot chocolate recipe, but you will probably love it. It’s a blend of bittersweet chocolate, milk chocolate, whole milk and heavy cream. Consider spiking the adult version with some whiskey, and serve with marshmallows. Yum! 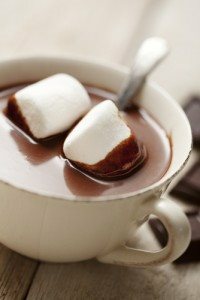 The liquor is optional for this simple hot chocolate recipe, which features Nutella, milk and whipped cream. After you serve this, you’ll need to stock up on Nutella to get through the rest of the winter! It’s that good. It only takes 8 minutes to whip up this fun twist on hot cocoa. It’s a delicious blend of brown sugar, cocoa powder, ground cinnamon, allspice, ground ginger, vanilla extract and sea salt. Top it with whipped cream! Starbucks and Dunkin Donuts have caught onto the salted caramel craze and now sell their own salted caramel hot chocolate, but you can save yourself a trip—and some cash—by making your own. This recipe, which takes just 20 minutes to put together, features milk and dark chocolate, lemon juice, salt and caramel sauce. This is hot chocolate at its best.